It’s a question we hear on a regular basis now, and coming out of the barefoot running movement, it’s a fair question. To answer that, we have to take a look back at some recent running shoe history. Over the past seven years or so, a large part due to the publication of Christopher McDougall’s book Born to Run in 2009, the running industry began experimenting with what have become known as “minimalist” shoes. 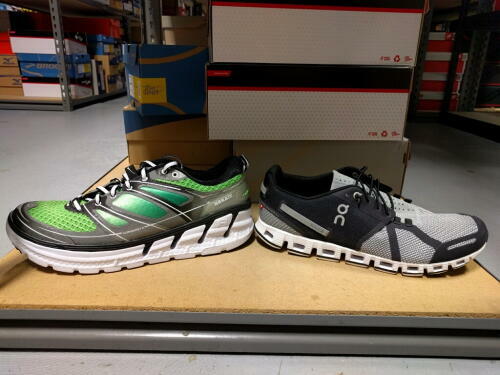 For years, the running shoe industry had been dominated by overbuilt stability shoes. Mcdougall’s book, in short, stated that traditional running shoes were causing more injuries than they were actually preventing them. His solution to this epidemic was to return to a more natural state of running. It wasn’t long before everyone was thinking barefoot running was the answer. Running shoe companies took note. It was in this period that the Nike Free line, Saucony Kinvara, Brooks Pure series, New Balance Minimus, the brands Altra and Newton, and the infamous Vibram Fivefingers came into being. I even ran my first collegiate cross country race barefoot. Everyone wanted to be a barefoot runner. For some people, the lighter and more minimal shoes were a welcome change and they found relief from nagging injuries and heavy shoes. But there were just as many people, if not more, who found that they couldn’t run in such minimally cushioned shoes. And injuries did not magically vanish with more natural running. Soon, a new brand, Hoka One One, came along with a what seemed to be a ridiculous idea in the middle of the barefoot revolution. If the shoe wasn’t absorbing the impact, your body was. What if there was a lightweight shoe with a lower heel-to-toe drop that was very cushioned? At first, many people thought the idea was crazy. Hoka was producing these massive orthopedic-looking shoes that seemed contrary to everything the barefoot movement had just accomplished. But the shoes were working and started to catch on. Now Hoka is the fastest growing brand in run specialty history. When a brand doing something so vastly different, like Hoka, is growing so fast, other companies have to pay attention. That is why shoes are starting to look thicker across the shoe wall. So what type of shoe is better? The one that works for you. There is no one shoe, no magic footstrike, no magic training plan that will work for every runner. As a runner, you should be a student of your body and how it responds to different things. If running in minimal and lightweight shoes has been working well for you, keep doing it if that is what you feel the most comfortable running in. If you like the cushion of a Hoka and that has kept you injury-free, that’s great! Listen to your body, and if you need help figuring out what kind of shoe could work for you, you know where to find us! On a side note, Pumpkin Spice Lattes are back. Just ask Erin!